﻿Not always do composers of instrumental works take the playability of their ideas into consideration. Jean Sibelius – himself an excellent violinist – must have been aware of the enormous challenges to the soloist, but he did not, however, envisage that the première of his violin concerto would be badly received due to the inadequacy of the violinist. That his op. 47 would become a showpiece of romantic violin repertoire is certainly not only due to the first-class soloists of our time, but also thanks to the work’s broad and expressive melodies. In the short introduction of the second movement, the leaping intervals of the violin – as though from nowhere – develop into a broad symphonic dialogue with a late-romantic inflection, which is unleashed to create an emotional climax in the 20-bar main theme of the second movement. 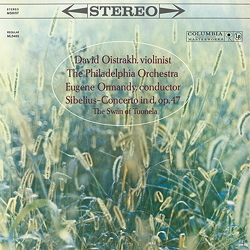 Seemingly purposely written for the nimble fingers of the world-class violinist, David Oistrakh and the evenly matched Philadelphia Orchestra present a superbly virtuosic and powerful rendering right up to the rousing finale. As an encore we hear "The Swan Of Tuonela" sing its tender, sublime song in a substantial solo on the cor anglais.